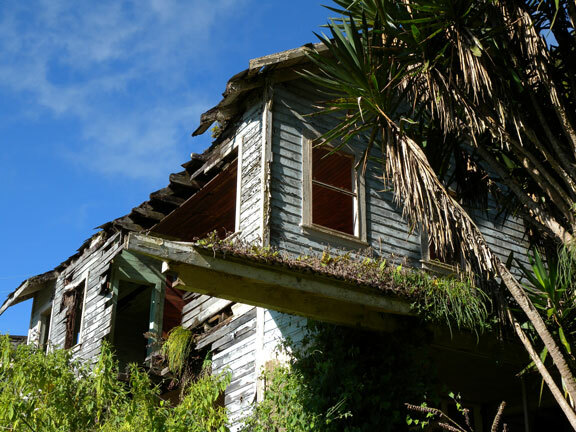 EL ROSARIO – If ghosts are real, they must live here. El Rosario is perched high in the San Juancito mountains, about a two-hour drive from the Honduran capital of Tegucigalpa. In its heyday in the early 1900s, the town was home to the richest mine in the western hemisphere. Today, the gold and silver is long gone, but the region’s rich history lives on. What’s left of the mine manager’s house in El Rosario, Honduras. It’s here in the partially- collapsed, weathered blue wooden structure that used to be home to the mine manager and his family. And in the deserted concrete building next door, which once housed an American consulate. “We live in a very historic town and it’s not really taken advantage of,” remarked Regina Aguilar, a long-time resident of the area. While the region’s mining heritage remains unexploited, the same can’t be said for its natural resources. The mineral wealth of the San Juancito mountains was first discovered by native Indians as early as the 15th century. It would later be exploited by Spanish conquistadors. But it wasn’t until 1880, and the arrival of the New York-based Rosario Mining Company, that the area was transformed. During its 74 years of operation, the New York and Honduras Rosario Mining Company extracted $100 million dollars (U.S.) worth of gold, silver, copper and zinc from the San Juancito mountains. But by 1954, the boom times were over. The mining company closed and thousands of people left the area in search of work. Today, the town of El Rosario is a small gem located within the boundaries of La Tigra National Park. What used to be the hospital is now a visitor’s center and hostel. Local people have renovated and live in some of the old wooden houses. Most of the other buildings, though, are in varying states of deterioration and lend the air of a ghost town. That feeling is only heightened by the wispy tendrils of cloud that creep down the mountainside and penetrate deep into the broad-leaf forests of La Tigra. 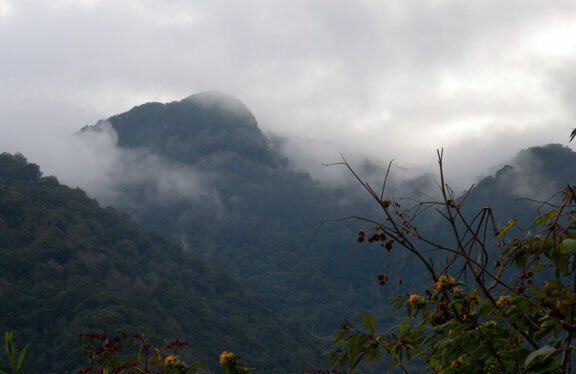 La Tigra National Park is a cloud forest. In fact, La Tigra supplies almost a third of Tegucigalpa’s drinking water, and is the source of fresh water for 33 surrounding communities. waterfall. Water is also collected in the old mine tunnel at Pena Blanca, which now serves as a reservoir. Evidence of the area’s mining heritage is scattered throughout La Tigra. The park’s main hiking trail, Sendero Principal, is in fact the old road once used to transport gold and silver bars by mule to Tegucigalpa for export to the United States. Another trail, Sendero La Mina, is dotted with abandoned mines and the ruins of mining buildings. An iron door built into the side of the mountain creaks open on a cement bunker, where the mining company once stored dynamite. But the real treasure is La Tigra itself. It’s been protected by various government agencies since the beginning of the 20th century because of its importance as a water source. In 1980, La Tigra was given the status of National Park – the first in Honduras. The 240 square kilometre parcel of land is a nature lover’s paradise. It’s home to more than 400 species of plants, including orchids, bromeliads, large ferns and vines. This rich habitat supports more than 200 species of birds – the most exotic of which is the Resplendent Quetzal, which was revered by the ancient Mayas for its long, iridescent green tail feathers. The park also shelters 31 different kinds of mammals, including pumas, peccaries and armadillos. Amid this natural beauty though, are lingering signs of the damage inflicted by Hurricane Mitch in October 1998. Earthen scars mark the spot where a landslide ripped down the mountainside, right into the town of San Juancito. Five years later, La Tigra got a financial boost from the Canadian government. Over the course of 30 months, Canada contributed about $435,000 to help upgrade trails, build a visitors centre and outfit park rangers with uniforms and tools for firefighting. “It was really good for us, but then the project ended,” lamented Jorge Anariba. Amitigra is now working with the European community on a major ecotourism initiative, aimed at remodeling the park’s trails and visitor’s centres. Their goal is to build on the 20,000 or so people who visit La Tigra every year. And who knows – maybe another ghost or two will show up for good measure. Cindy Burgess is a Toronto-based freelance writer. Rain gear and extra warm clothing. The weather in La Tigra can change quickly, and the temperature drops as you climb to higher elevations. Water, high-energy snacks, toilet paper and a first aid kit.